U.S. sources told CNN on Wednesday they do not believe the attacks that killed Ambassador Chris Stevens and three other Americans in Benghazi, Libya, were in reaction to the online release of a film mocking Islam. "It was not an innocent mob," one senior official told the news network, adding, "The video or 9/11 made a handy excuse and could be fortuitous from their perspective, but this was a clearly planned military-type attack." The U.S. sources also said that two U.S. properties were attacked in Benghazi: first, the main compound where Stevens was, and later, and attack on another U.S. compound in Benghazi. Regarding the attack on the main compound, a U.S. source said that three people – Stevens, Sean Smith, a U.S. Foreign Service information management officer and a security officer – were in a safe room. The house was on fire and the security officer got out. The officer then went back in for Stevens and Smith, and he found Smith's body and retrieved it. The officer could not find Stevens, the source said. CNN also reported that a London think tank with strong ties to Libya speculated Wednesday that Stevens was the victim of a targeted al Qaeda attack "to avenge the death of Abu Yaya al-Libi, al Qaeda's second in command killed a few months ago." The think tank said the attack was "the work of roughly 20 militants, prepared for a military assault." It noted that rocket-propelled grenade launchers do not normally appear at peaceful protests, and that there were no other protests against the film elsewhere in Libya. 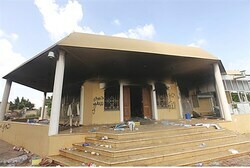 Libya's Deputy Interior Minister blamed the U.S. for the attack, saying that embassy staff should have been evacuated by the United States as soon as news of the controversial film on the life of the founder of Islam was released. "They are to blame simply for not withdrawing their personnel from the premises, despite the fact that there was a similar incident, when Abu Yahya al-Libi was killed," Minister Wanis al-Sharif told reporters. "It was necessary that they take precautions. It was their fault that they did not take the necessary precautions," Sharif repeated. The "protesters" who attacked the embassy, he added, were more heavily armed than the Libyan security personnel who were assigned to protect the U.S. Consulate.